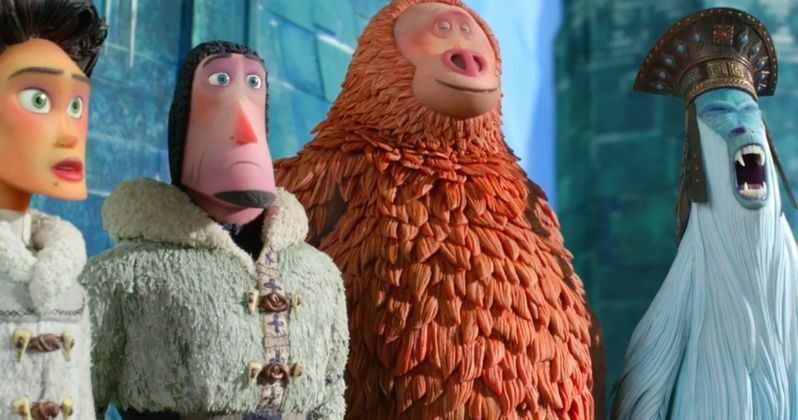 Missing Link is the fifth film from the brilliant stop motion animators at Laika Studios. The makers of Coraline, ParaNorman, The Boxtrolls, and the Academy award nominated Kubo and the Two Strings, deliver their most ambitious work yet. A lonely sasquatch, voiced by the hilarious Zach Galifianakis, reaches out to a famed English explorer. Sir Lionel Frost (Hugh Jackman) travels to the American west to find the fabled creature. He's surprised to meet the genteel, accident-prone, avocado-shaped primate. Sir Lionel calls him Mr. Link, and their globetrotting adventure begins. Their goal is to find Mr. Link's cousins, the abominable snowmen, aka Yetis, in Nepal's Himalayas. They are joined on the trip by Adelina Forthright (Zoe Saldana), Sir Lionel's irate ex-girlfriend. Laika Studios invited a group of journalists for a tour of their facilities and a behind the scenes look at Missing Link. Located in beautiful Portland, Oregon; Laika is a place where dreams literally come true. They have a staggering two hundred and sixty-thousand square feet of production space. Missing Link required one hundred and thirty-thousand square feet for the sets and sound stages. We were met at the studio entrance by production manager, Dan Pascal; who's worked on all five of Laika's films. He would be our friendly and informative guide throughout the day. The first impression of Laika is the creative atmosphere. The walls are covered with pictures, puppets, and paintings of their movies. Every employee, casually dressed in hip northwest gear, had a smile on their face. This is a place where people love coming to work. "I wanted the Indiana Jones of stop motion. The film is a roller coaster, kaleidoscope, and travelogue." Chris Butler and the wizards at Laika spent five years making Missing Link. This includes a year of pre-production and script work, two years of filming, and then two years of post-production. Their previous film, Kubo and the Two Strings, had twenty locations. Missing Link has sixty locations with different backgrounds, sets, and color schemes. The film is truly bigger than anything we've seen in stop motion animation. Our next set of presentations centered on the ten inch tall, state-of-the art character puppets. Deborah Cook, Missing Link's costume designer, went over the materials and processes used to make the puppets clothing. A variety of fabrics, weaves, cutting edge dyes, and patented stitching technology were invented. The idea was to avoid using "weaves with rectangular shaped patterns". The camera resolution on the puppets is so detailed, the lack of rectangular patterns stops rippling effects on screen. This painstaking detail was also used to create a new type of resin for Mr. Link's fur. Every strand was individually stitched to prevent a "boiling" or "rolling" effect when the puppet was moved. "Eighty-six teams worked on manipulating the puppets, from wireframe, to concept, to sculptures. Each Mr. Link puppet has two-hundred and fifty components. We even put in a breather, so we can see his avocado-shaped belly move." "The first printer used liquid resin for Coraline. The second printer used powder, then spray-on color glue for ParaNorman and Kubo. Now we have a full color, voxel precision printer, a Stratasys, that can print in sixteen micron layers." He had the machine print a few demo faces for us to inspect. There is no curing in the process. The printer also sprays down a support material. The finished product is hard to the touch and astonishingly detailed. The rapid prototype machine takes ninety minutes to print a row of faces. An interesting note is that the process takes the same amount of time no matter how detailed the printed structure. For example, a human hair has a width of seventy-five microns. This 3D printer prints at sixteen microns! The printing demo was jaw-dropping, but just a warm up to the amazing second half of our tour. Next up was Ollie Jones, Head of Rigging. He took us to another sound stage to show us the various rigs used to move the puppets. Every puppet had a rig mechanism built in the back to control general movements. Then there were huge rigs designed for specific scenes. One especially cool rig was a giant recreation of Mr. Link's mouth. We were also shown a specially designed rig for a scene in a wagon. Not only were the puppets controllable, a bevy of different knobs moved the curtains to simulate wind. The rigging team is largely forgotten by audiences because all of the rigs are digitally removed during post. Dan Pascal took us to several other sound stages to see the sets from Missing Link. They were introduced by production designer Nelson Lowery. Jaw-dropping is an understatement. There were mammoth sets, a frontier town, train station, and railroad. They took up an entire sound stage, and were designed to be broken apart; thus allowing filming from every angle. We were also shown massive sets of the Himalayan forest, Yeti temple, an ocean steamer, and ice bridge. I felt like a kid in a toy store. Nelson Lowery also showed several smaller sets specific to integral parts of the movie. I'll skip describing them to avoid plot spoilers. The craftsmanship and detail to the Missing Link sets were astounding. "The goal was four seconds of completed film a week. We had one-thousand four hundred and eighty-six effects shots, which were two-hundred more than Kubo. This included five hundred and thirty-one digital assets, three hundred and twenty-five digital puppets. We also removed over a thousand rigs digitally." I can't even comprehend all of these teams working to achieve four seconds of film in a week. Steven Nelson was sure to explain that every hero character was a stop motion puppet, not CGI. He showed a scene with every shot broken down in its composite part. So we saw the puppets with rigs, then the VFX, the CGI additions with lighting, and the rigs removed. Filmmaking on this level requires artistry, expertise, and patience. It's a pity the voice over talent gets all the publicity when the films are released. Missing Link will be released globally on April 12th. The film is produced by Laika Studios and distributed by Annapurna Pictures. I've been lucky enough to see many sets as a journalist. The tour of Laika was like visiting Santa's toy factory. Missing Link's production value is bar none the pinnacle of stop motion animation. Laika's films are always entertaining and sophisticated. Missing Link is another feather in their cap. I can't wait to see it on the big screen.